Whether you're looking for a light and easy side salad or a pasta or potato salad for your cookout, you're sure to find an excellent recipe in this list. These are some of out top-rated salads, perfect for family meals, potluck dinners, cookouts or picnics, and special occasions. The red cabbage slaw salad makes for a colorful alternative to everyday coleslaw, and the flavors are amazing. Golden raisins and chopped pecans add a burst of flavor and texture​ but feel free to leave them out or replace them with another ingredient. Bacon adds complexity to this chicken and pasta salad, along with the complementary flavors of diced tomatoes, celery, and onion. Use mini penne pasta, macaroni, or a similar pasta shape in this pasta salad with chicken and bacon recipe. Dill and chopped dill pickle, along with a tangy mayonnaise and sour cream dressing make this red potato salad extraordinary. This broccoli salad recipe is always a hit. Raisins, bacon, and a sweet and tangy mayonnaise dressing are among the ingredients. This delicious pasta salad with peas and ham is hearty enough to be served as a main dish for dinner or lunch. Try to prepare this in advance and chill it for several hours or overnight for best flavor. This green pea salad with easy creamy dressing is not only attractive—it's packed with flavor and texture. The salad includes bright green peas, shredded carrot, bell pepper, red onion, and celery. Serve this salad with any summer meal or cookout, or take it along to a potluck event or picnic. Make this a few hours in advance and chill thoroughly for best flavor. This crunchy classic carrot salad with raisins is flavored with a simple mayonnaise dressing. Use multicolored carrots for a beautiful salad. This potato salad uses roasted potatoes and onions, giving it an interesting flavor. This roasted potato salad will be a hit at any cookout or potluck, and it's wonderful with grilled meat, chicken, or burgers. Try this delicious potato salad recipe for your next summer gathering. This tasty easy cucumber salad with sour cream and dill is a great way to enjoy a fresh summer favorite. The vinegar and oil dressing makes an excellent dressing and a nice alternative to mayonnaise dressings for this Carolina slaw. 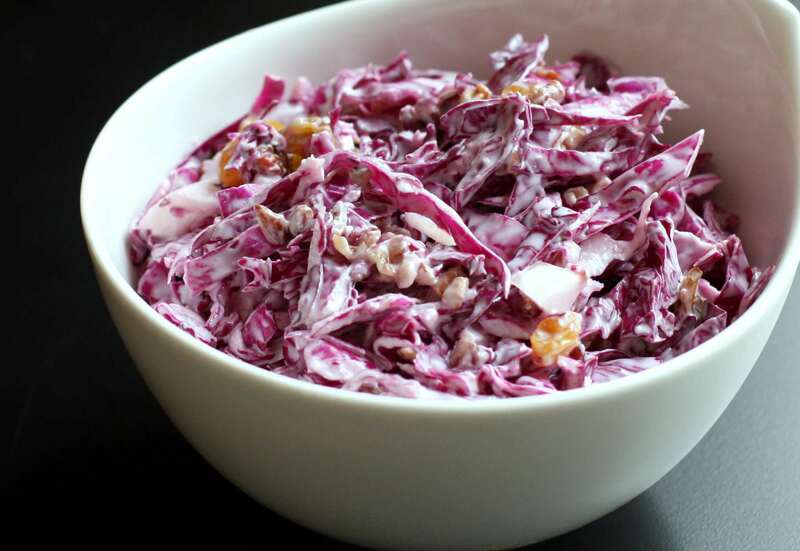 It's a great coleslaw to pile onto pulled pork or pulled chicken sandwiches. Fresh or frozen green peas add flavor and color to this delicious potato salad. This potato salad with peas is easy to make and perfect for any cookout or potluck. This classic wilted spinach salad is topped with hard-boiled eggs and crumbled bacon. This spinach salad with figs and warm bacon dressing is not only good and attractive. Goat cheese or blue cheese are crumbled over the salad and then it's dressed with an easy warm dressing. Roasted cauliflower and quinoa salad are tossed with peas, toasted almonds, and lemon juice. A variety of vegetables give this garden pasta salad crunch and color, and the mayonnaise and pesto dressing flavors it perfectly. BLT lovers will love this salad. This BLT macaroni salad is made with plenty of bacon. The salad is served on fresh sliced tomatoes and lettuce leaves. Bacon and pecan halves add texture and flavor to this easy beet salad. The salad includes shredded or crumbled cheese and spinach leaves. The dressing is a tasty blend of mustard, honey, and balsamic vinegar. This basic tossed salad with homemade croutons and red wine vinegar dressing is a classic everyday side salad, and it is an essential menu item for a big family meal or cookout event. This uncomplicated Tex-Mex black bean and corn salad are dressed with an easy, tangy dressing made with, lime juice, cilantro, apricot preserves, and a variety of seasonings. Cooked shrimp and a variety of vegetables make this rice salad hearty enough to serve as a main dish. This shrimp and rice salad is perfect for a hot summer lunch or evening meal.